I love baking! I think I always have. My mom is a FACS teacher (formerly known as Home Ec.) and I grew up with her teaching me all of the tips and tricks she knew. Thinking back now I love how easy and natural it was working side by side with her to make delicious things. And now I’m doing the same thing with my daughters. But most especially my second oldest, Kennedy. She has a love and a knack for baking that leaves me a little in awe. Not only have we enjoyed working side by side baking up a storm, but she has helped me stretch and learn and grow in my recipe skills. We’ve tried so many new things and it’s been a blast experimenting with her. I can’t wait to share some of those fun recipes with you. But first, we’re going to start with a complete classic. 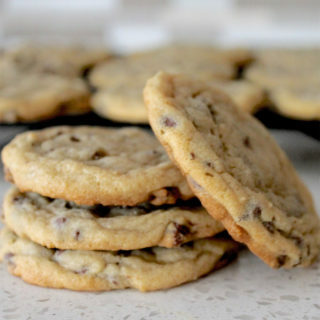 Ultimate chocolate chip cookies. Kennedy is only 11 and she’s been making chocolate chip cookies on her own for about two years now. It’s actually been really fun to let her take the reins completely. I can seriously just kick back and relax while she does all the work now. And it only stings my ego a little bit that her cookies are better than mine! She’s got a magic touch. Really though, this recipe for ultimate chocolate chip cookies cannot be messed up. You are going to love how amazing these cookies turn out every time. Let’s get started! Second, mix the eggs, butter, sugars, and extract until light and fluffy. Helpful hint: Part of the greatness of this recipe is using a cup of brown sugar. Don’t think you can get away with using two cups of regular granulated sugar! Always use a cup of each. Third, while the mixer is going slowly add sifted dry ingredients. Fourth, stir in the chocolate chips. Don’t over mix! Next, drop by spoonfuls onto a baking sheet covered in non-stick cooking spray or lined with parchment paper. Helpful hint: I like using a cookie scoop but a regular spoon will work well too. Then, bake at 350 degrees for 10 minutes. Don’t over bake! They may look like they aren’t done but they’ll be perfect I promise. Let the cookies cool slightly on the cookie sheet, then move them to a cooling rack. Mix the eggs, butter, sugars, and extract until light and fluffy. While the mixer is going slowly add sifted dry ingredients. Stir in the chocolate chips. Don’t over mix! Drop by spoonfuls onto a baking sheet covered in non-stick cooking spray or lined with parchment paper. Bake at 350 degrees for 10 minutes. Don’t over bake! 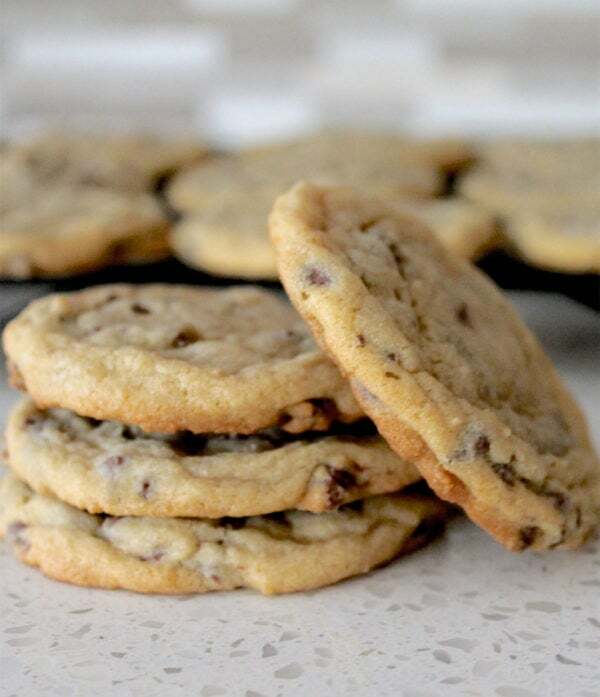 These ultimate chocolate chips cookies are perfect for so many things! Make a batch to take to the next school bake sale, leave some ready on the counter for an after-school snack for your kids, plan a girls night and bring some for everyone in the group, tie them up with some red twine and give them as Valentine’s Day gifts to all your neighbors. The possibilities are endless! Who can resist chocolate chip cookies? I just know you are going to love these cookies! Try them out with your family and let me know what you think! And be sure and tag us in your posts. We love to see our readers’ creations! I made these cookies and they were wonderful. Will be making them again. I’m an early riser, so baking in the winter is one thing I enjoy doing. Thanks for sharing. I am so glad to hear you are loving these! They have been our family favorite for years. In fact, my 12-year old, Shelby, has the recipe memorized. Thanks for commenting!